It is Tuesday morning, and I complement my negotiation coaching session with the soothing and tranquil soundtrack of a high-powered leaf blower in the background. I peek outside the window, and see the building maintenance guy vigorously chasing an ever moving mountain of leaves. When I later leave (badum-tish!) for lunch I can’t help but notice how pristinely spotless the property looks. Well done Mr Leafblowerman! Certainly a win/win transaction, right? Yes, but that’s not good enough. Let me explain. On Wednesday mornings I again enjoy the soundtrack of a leaf blower, but the relaxing acoustics sound slightly different as they now originate from the building next door. I again glance out the window, and see Mrs Leafblowerwoman standing in a cloud of dust and leaves. She has managed to lift everything off the ground, and is now patiently waiting for it all to settle… on our side of the fence. HEY WAIT A SECOND!! She is doing exactly what our guy is doing. And if we had a win/win negotiation with him, then surely our neighbours have win/win negotiating with her? But I’m certainly less excited about their deal – particularly as my car is now covered with dust and leaves. How could this possibly be a win/win? Here’s what’s going on – we are using too simplified labels to describe negotiation. 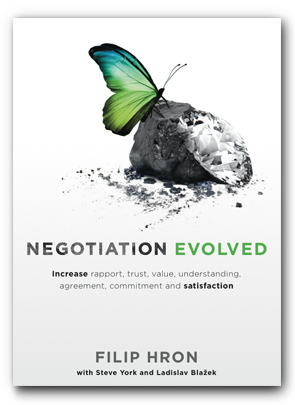 In our book we deal with this by describing four negotiation dynamics. The first one is about dividing value, or transferring value (or problems!) from one party to another. This usually results in win/lose outcomes. The second focuses on ensuring that value is increased for both parties. However, it is important to realise that sometimes this value is not created, but rather transferred from other parties who are not part of our negotiation! Thus a win/win deal between two parties may still be a win/lose deal between this group and other parties! If value is merely transferred in the system, then value is not created, and therefore our actions are zero-sum – if someone wins, then someone, somewhere, loses. We can contrast this with a sustainable approach to negotiation, which is focused on creating and maximising value in the system. In the book we refer to this as maximisation, and boy is it powerful. And it doesn’t have to be difficult. In our leaf blower example, if Mr and Mrs Leafblowerperson instead pick up the leaves and put them in the bin, then the leaves (i.e. the problem) would be removed from the system, as opposed to being perpetually passed around.